As a mature feminist I should probably think that princesses are a remnant of patriarchal society that should by now be thrown away with other rubbish. Well, in a way I do. But still, when there is an actual, real, royal – blooded, beautiful princess getting married in the neighbouring country, I must admit that something in me is evoked. We Finnish people are so sensible and not at all prone to unnecessary, costly silliness like a royal family, so I guess we can be a little bit delighted for what happens next door, in Sweden? Recently, I have been very brave and done lots of things that have felt immensely difficult. So I decided to reward myself and bake a cake! And spend a couple of days only doing only silly things with my girlfriends. So we watched Princess Victoria’s and Daniel’s wedding and drank strawberry – sparkling wine, eating a cake that in Finland is called a princess cake. Partly because in honor of the actual princess and partly to remind myself of some princess – like virtues. A Real Princess, the mythical, archetypal creature of fairytales, is never angry, never mean to other people, and always in possession of her power and her beauty. And there is always the happy ever – after to her story. In real life, the princesses get eating disorders and have unfaithful boyfriends, and I guess the only true happy end awaiting us all is the peaceful grave. But still, there is always enough reason to spent a day dreaming princess dreams, with a piece of cake, and congratulate yourself for a work well done. A princess cake is usually a quite an ordinary sponge cake, filled with vanilla custard, raspberries and covered with a layer of green marzipan. 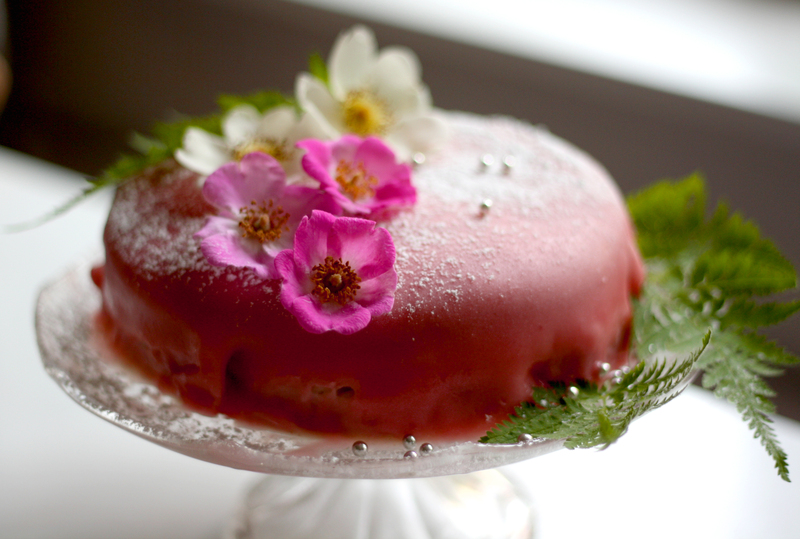 Mine was a little different, because I used strawberries and pink marzipan for the ultimate princess – effect. The custard or pudding I made of oat milk and starch. First, mix the vanilla powder and sugar with 3,5 dl of oat milk, and bring the it to the boil in a small cooking pot. Mix the potato starch with the remaining 0,5 dl oat milk, remove the pot from the heat and pour in the starch – liquid, carefully whisking. Then bring the oat milk to boil again, without mixing. Don’t cook, but remove the pot from the heat right when you see the first bubble. Whip up the oat cream, and blend it together with the custard. Cut the cake into to halves, and moisten it with oat milk. Fill the cake with mashed strawberries and half of the custard, and finally cover the whole cake with a layer of remaining custard mixture. Roll the marzipan into a flat round layer, bigger than the cake, with a rolling pin. Using a sheet of baking parchment under the marzipan might help, as well as sprinkling the sheet with powdered sugar. Lift the marzipan – layer carefully on top of the cake, and cut off the extra at the “hem” of the cake. Decorate with real roses and sprinkled powdered sugar. Isn’t change always worth a celebration? For better or worse, change is the attribute of all life: matter evolves by the laws of entropy, towards more chaos, and the living things are constantly on their way towards death. No moment is static, transformation is inevitable. A rite of passage is something that prepares us for the change, makes it easier to accept, since we tend to cling to the past with a fierce devotion. We celebrated the bachelorette party of my friend who was getting married. Marriage is one rite of passage to adulthood, though not as important as it used to be. The Finnish folk poetry describes in vivid detail the sadness of the bride, when she has to leave her sisters and brothers, the safety of her childhood home and most important of all, her dear mother, as sweet as honey or berries in the forest. Waterfalls of tears were shed when the young bride left her home to never return, to be owned by the family of her husband, and be as the daughter – in – law the lowest in the hierarchy of a household. The ways of marriage have luckily changed quite a bit, and these days marriage is a sign of mutual love and commitment, not a grim undertaking made in order to keep the human race existing. On this occasion it was indeed the bridegroom who left his sunny country to come to the cold and unhospitable Finland. That weekend, we didn’t cry (except for me, a little bit), but drank pink sparkling wine, had a lush breakfast with beautiful live music at the cafe Villi Puutarha (” The Wild Garden”, which is one of the few places with vegan things to eat in Helsinki), acquired a pair of pink handcuffs at an adult shop, tried out pole dancing and sung at the top of our voices in a karaoke taxi. 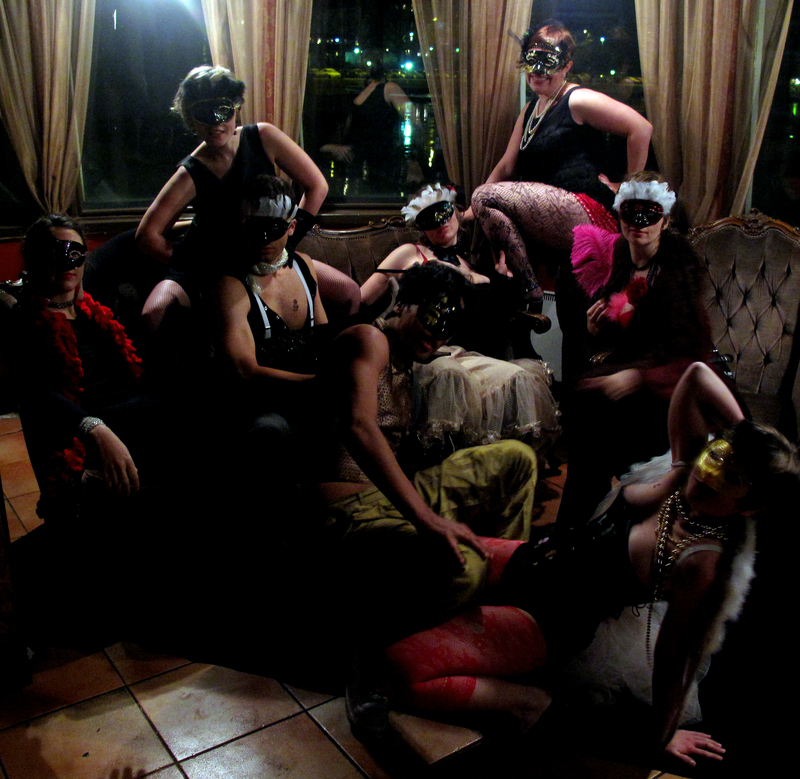 Finally we adorned ourselves with corsettes, beads, plenty of sparkle and make – up and headed for a burlesque party. Our beautiful, not so shy bride won the tassel twirling competition (don’t know what that means? Well find out, I won’t tell you), and the gorgeous bridegroom impressed everyone by an improvised Brazilian street – capoeira – dance show. The night was ours. We partied and danced with the intensity of people taking part in a transition rite, submerged in a brazilian – burlesque fantasy world. But what does a frilly, mask – wearing, tasseled, lace – and gold – adorned foxy lady or gentleman eat before she or he hits the party? 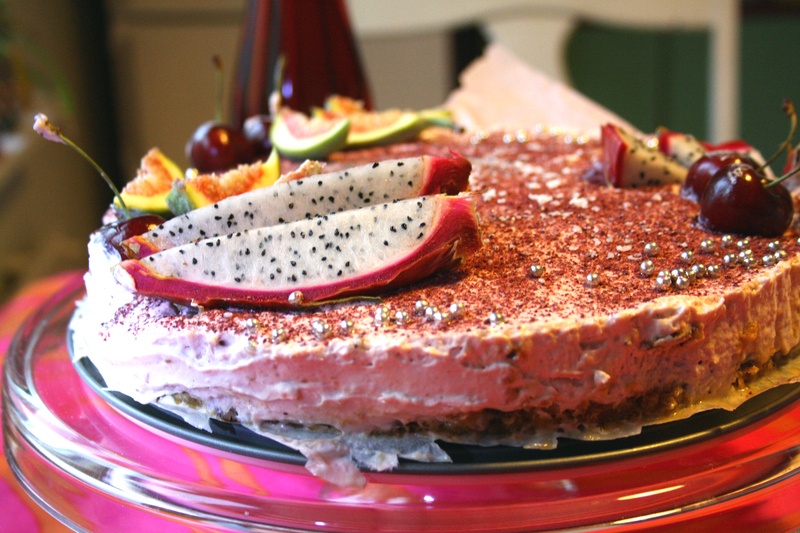 Of course a rosewater – strawberry – chocolate mousse cake, decorated with fresh cherries, figs and pitahaya.. I started the day before by draining the soy yogurt in a sieve that was lined with coffee filters. The following day I made the crust: I crumbled up the cookies, and melted the margarine. Then I mixed both and patted the mixture at the bottom of a springform pan (diameter 26 cm), which was covered with a piece of baking parchment. Then I made the chocolate ganache. I heated up the milk in and added the chocolate, mixing until it was melted. I spread this evenly on the crust. Then I made the mousse. First I blended the strawberries, the vanilla, the icing sugar, the soy cream cheese, the drained yogurt,the rose jam and the soy cream with a handheld blender until it was nice and fluffy. Then I heated up the water and the rose water in a pan, and added the agar – agar. I boiled the mixture, mixing it constantly for a few minutes, until the agar – agar was diluted. Then I hastily poured it into the mousse – mixture, through a sieve and mixing carefully with the blender. Then I poured the mousse onto the crust, and put the cake in the fridge. – agar is a better gelling agent for mousses than gelatin, even if most people don’t know this. The mousse produced by agar is always fluffy, and never dry like the gelatin mousses sometimes are. And yes, it will set, but you’ll have to use enough agar! – when diluting the agar it is often easier to start with a bit more liquid and let it evaporate by boiling the mixture a little bit longer, than to start with a tiny amount of liquid, like often is instructed. – you can dilute agar to other liquids than water, but something like cream is already too thick for this purpose. – the agar starts to set right away when you remove the pan from heat, so you have to be fast. Allow it to cool maximum a minute! – use a sieve when you pour the agar – agar liquid into the mixture you want to make a gelee of. There are anyway always some lumps in it. – You will see right away, if there is enough agar in your mousse, because it will start to set immediately. The following day, if there appears some liquid around the cake that probably means that something went wrong, and the mousse has not set. The blueberries are ripening in the forests, and there seems to be a lot this year! Also the strawberry season is still going on. Sadly, I must tell you that if you have not tasted Finnish wild blueberries and cultivated strawberries, you have no idea how they are supposed to taste. It has something to do with the almost continuos daylight of the Finnish summer, it makes the sugar content of the berries really high. I took a rowing boat over with a couple of friends to the secluded island of Vartiosaari, which lies right in front of one of the eastern suburbs of Helsinki. We fould plenty of huge blueberries, the first rasberries and even a rare treat: some wild strawberries. And in the forest, some lovely golden specimens of the looked after chanterelle! We also met a guy who was apparently a goat herd, since he had two goats with him. I petted the other one. So all in all, a profitable trip, I would call it. I made this tarte of the blueberries, since I think some of the gorgeous flavour is lost if they are baked. I was not completely happy with the end result: I think a drop of lemon juice in the filling and some whole wheat flour in the crust would make it just perfect. And yes, I’m aware of the fact many people don’t consider honey a vegan ingredient, but I do. The honey that I’m using is freshly made and from a local organic farm, very nice! First I heated the oven to 200ºC and then started by making the crust: it was simply made by mixing the dry ingredients in a bowl and then adding the margarine, honey and finally the water. Then I greased a springform bake tin 24 cm in diameter, and coated it with some semolina (flour is fine too), and patted the dough into it with moistened fingers. Then I baked the crust in the oven for 10 minutes. Meanwhile the crust was baking, I made the filling by mixing the ingredients. After ten minutes I took the crust from the oven, and poured the filling onto it. Then I baked my tart for an additional 30 minutes or so, until the filling was set and the tart was a little bit brownish one the edges. I let the tart cool down, and then added the strawberries and blueberries on top. Then I made the glazing by boiling the sugar with pectin with water until the sugar had diluted. Then I spooned the glazing carefully on top of the tart. The idea with glazing is that it keeps the berries stable on top of the tart, which looks really fancy. Me and my friend Pinja were so impatient that we didn’t allow the glazing to cool down, but ate half of the tart right away. First, in order to avoid confusion, there are two types of halva: Indian halva, which is kind of a pudding made of semolina, and Arabian halva, which is a sweet made of sesame seeds. Indian halva is one of my all time favourites, when I’m cooking in a hurry for big crowds. It can quite easily be made for like a hundred people in a 10 liter pan. Besides, hippies love it! 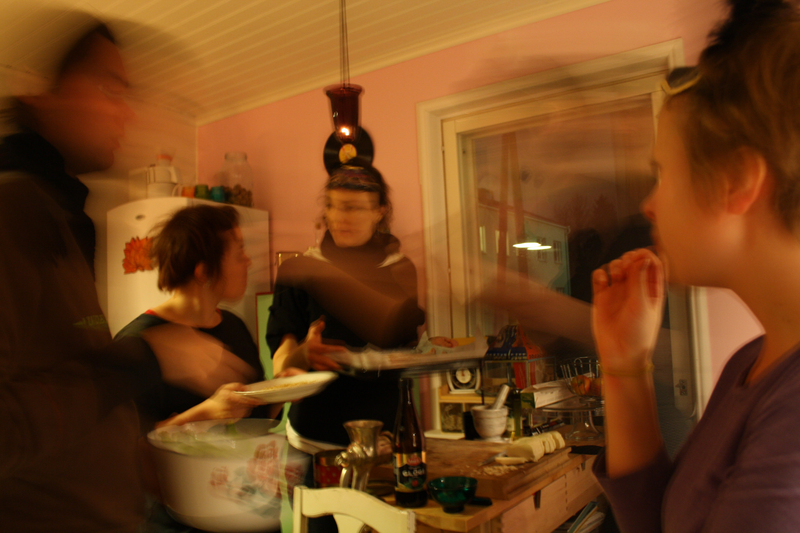 The idea of halva was presented to me by an ex – Krishna devotee when I was working in an ecovillage in Central Finland. This particular recipe I invented last summer for a hippie – festival catering. For the hippies I shaped balls of the halva, since it was easy to serve like that, and hippies generally love to eat anything that is in a form of a ball (why that is so I cannot tell). Though, it can also be made a so that the consistency is a bit runnier and then served with a spoon. Rosewater can be obtained in Asian stores and at the chemist’s, but I have sometimes used a brand of organic rosewater (Julia Lawless Aqua Oleum), which was definetely the best, since it smells most like real roses. Rose is an edible flower, and a very decorative one too! Though it’s good to remember to take out the white part of the petals, since it is bitter. I usually collect the petals of Japanese rose or rosa rugosa which grows very all over the place in Finland, and blooms from June to August. This halva is made in a cooking pan. I started by toasting the semolina on dry pan for about ten minutes, stirring it all the time, in order to avoid burning. When the semolina was very slightly yellow – brownish, I added the coconut, spices and sugar, stirred hastily and then quickly added the oil, milk and strawberries and the rose water. Then I turned down the heat and covered the pan with a lid, and let it simmer on low heat for about 15 minutes. I was using frozen strawberries, so I guess it would go faster, if you used fresh ones. I shaped the halva by pressing it to tiny bowl and then turning it over on a plate, kind of in the same way children make sandcakes. 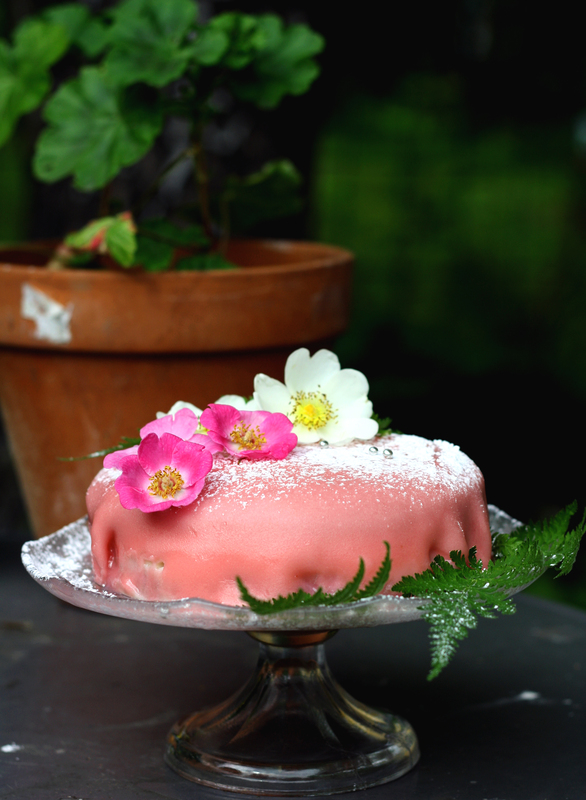 I decorated the halva with rose petals, grated coconut and freeze – dried strawberries. It could also be sprinkled with rose water, to enhance the taste and smell. There was some leftover champagne from my working place, and I felt such a shame to throw such luxurious stuff away. So I was wondering what I could make out of it. I found some non – vegan recipes for champagne cakes, and decided to try to make something like that, but vegan. I also thought what would go well with the taste of champagne: traditionally it’s often strawberries and chocolate… So this is the end result: a vegan strawberry champagne cake with chocolate topping! So I made this cake for my friend Pinja’s birthday party. First I melted the vegetable margarine in a pan, and set in my cold outer corridor to cool down. Then I pureed the strawberries, using a handheld mixer. After that I mixed the dry ingredients in a bowl, and then added the pureed strawberries, the champagne and finally the margarine, careful not to beat it too much. Voilá! The consistency of the cake batter seemed right away perfect! I poured it into a greased cake tin, about 24cm in diameter and baked in the oven that was preheated to 175 C about 40 minutes, until the cake was nicely brown and did not stick to the edges of the cake tin. I put the cake to my corridor to cool, and after about two hours added the topping. The topping was simply made by melting the chocolate and adding the margarine to it, and then beating the mixture smooth. It is indeed a very good idea to melt the chocolate in a microwave oven, if you have one, since otherwise it is too easy to get water into the mixture, which will make the consistency crumbly. I put the cake again cool down, and when the topping had hardened, I decorated it with a letter P that I made out of marzipan, and hearts that I made out of the powdered sugar and red juice paste. The juice a used is something that has been hanging around in the fridge for ages, and it has become rather thick, so it gives out a very nice colour. I usually just use an old plastic bag (the brand Minigrip is good, or any other bag with a distinguishable corner) when decorating, I pour the paste into a corner of the bag and, squeeze tight and cut off the corner. Then it is possible to draw all kind of nice shapes on top your cake. I suppose that in this recipe it would be very much possible to use sparkling wine instead of champagne. 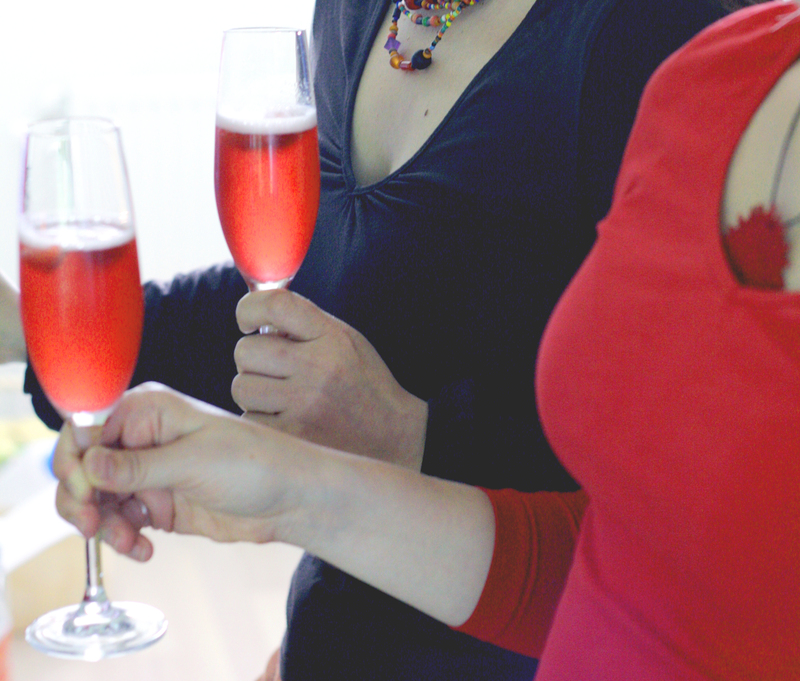 The champagne that I used was rather dry, so if you are using something more sweet, maybe adjust the amount of sugar. People at the birthday party liked the cake well enough, even if I did not think it tasted much like champagne or strawberries… they said that it was “a cake for grown – ups”, whatever that means, and said that there was definitely a taste of champagne in it. As an afterthought I would next time perhaps make the cake a layered cake, and put the strawberries in between the layers, to make the taste clearer.